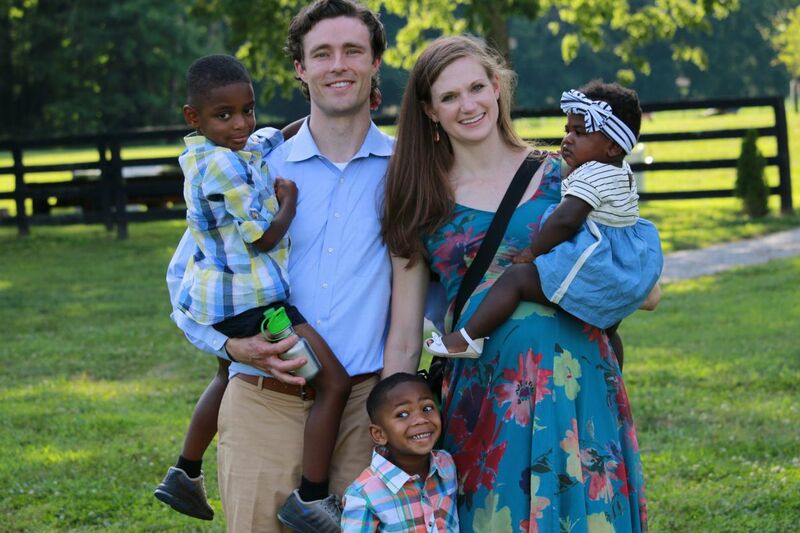 Graham and Lindsey Johnson with kids (left to right) Pax, Titus and Nova. A RECENT LULL IN THE CHAOS: At a family wedding in Kentucky, with all three kids dressed up — and fascinated by roaming deer — far from their usual urban turf. When Lindsey was 5, and her baby brother had just joined their family through an open adoption, her dad shot a video: Lindsey decked out in dress-up clothes, chattering about her "wedding" and the baby she had just adopted. Seventeen years later, at her actual wedding, Lindsey's dad played that video for 250 guests, including several adopted cousins on both her side and Graham's. "We always thought we'd have kids," Lindsey says. "And adoption was just another normal way to grow your family." But not yet. They were still young: 22 and 23, college pals who'd met on an intramural volleyball team. Lindsey was wary of dating — she didn't want to ruin a good friendship — and a bit startled when Graham presented a list of the qualities that attracted him to her: Intelligence. Kindness. A desire to make the world a better place. She said yes to a first date, a visit to a hole-in-the-wall candy shop, in pouring rain. A year later, she said yes again when Graham dropped to one knee on a lakeside dock and fished a ring from his pocket. He was in medical school then, in Little Rock, Ark., and they wanted to feel more settled before raising a family. When the couple moved to Philadelphia — Graham began his residency as a family physician and Lindsey started law school — they tried to conceive, with few expectations and, always, an openness to adoption. "We knew we could be happy either way," Lindsey says. So when conception didn't happen, they dived into the adoption process — background checks, a profile book that highlighted their love for travel and their large, extended families. Within months, they were meeting with a woman who was 20 weeks pregnant and certain that she wanted her baby to be adopted. "She wasn't who I imagined," Graham says, "but better: smart, a real person who had this plan." Lindsey went to all the prenatal appointments. She heard the baby's heartbeat. She learned the gender. Still, she felt uncertain. "There was a part of us that was always nervous: What if she changes her mind?" The birth mom was induced at 37 weeks. Lindsey cut the cord. "I had delivered babies in med school and been around a newborn nursery," Graham says. "Seeing an immediate newborn can be shockingly beautiful. But when it's yours, it's something different." They named the baby Pax, meaning "peace" in Latin. They also began thinking about a second child — another transracial adoption, they hoped. They'd purposely joined a multiracial church and moved to a diverse part of West Philly; they talked to African American friends, asking blunt questions like, "What do you think it takes for a white couple to adopt black kids?" and noting not only the verbal responses but their friends' body language. "Our impulse was to be open, but we didn't want to be naïve," Lindsey says. Pax was still little, barely able to say "baby," when the couple got the call about Titus. He was 10 days old, a tiny infant dozing in a car seat, when they met him, his birth mother, and the great-grandmother who had been caring for him. "She was trying to get a read on us," Graham recalls. "And as much as we wanted to hold [Titus], we were focused on getting to know them. Toward the end, when it seemed like it was going to be a good fit, the birth mom said, 'Do you want to hold him?' We both burst out, 'Yes!'" They left that meeting with a diaper bag, a pile of baby clothes, a murmured prayer from the great-grandmother, and a new son. They envisioned a third child — in a few years, perhaps, when both boys were potty-trained. But sooner than that, they received a call from Open Arms Adoption Network about an infant girl, born a few weeks premature, in the NICU at Einstein Medical Center. The birth mother had already signed the papers and left the hospital. To protect the boys from possible disappointment, Graham and Lindsey told their sons that they would be caring for a baby for a little while. But the day they brought Nova home, Titus ran downstairs with a serious look on his face. "Dad," he said. "Where is she?" "They were old enough to own being the big brothers," Lindsey says. And life rocketed on — a jumble of toys and tears and diapers and water-glugging contests at the dinner table. In January, Lindsey felt a little strange. Three of the couple's sisters-in-law were pregnant; maybe their sensations were contagious. At Graham's suggestion, she took a pregnancy test. Then another one. Then one every day for the next week. The result: unequivocal. Their reaction: "Oh, not now!" They'd been married for nine years; this was their first pregnancy. "It was just one of those ironic things," Lindsey says. They did their own version of a gender reveal, taking the kids out for ice cream and planting a blue candy in the bottom of their cups. The boys dubbed their soon-to-be sibling "Pizza Baby Popcorn," and Lindsey's pregnancy has proven a conversation-starter for talk about all the ways there are to make a family. "We've always said, 'All babies come in a tummy. You came in your birth mom's tummy,' " Lindsey says. After a parent at Pax's preschool gave the kids a toddler-appropriate explanation of reproduction, Pax came home talking confidently about "the egg and the Smurf." The new baby is due in September. For now, the family's life is fireflies and Popsicles, a 10-hour drive to Kentucky in a car with three kids, dinners when the boys can't stop cracking each other up and Nova just wants to walk away…, and each night's aftermath, when Lindsey and Graham mop up the spills and talk about every sweet and stressful moment of the day. "We'll look at each other and laugh and say, 'This is us,' " Graham says.